The image of the armored train slowly running on the railroad between vast green patches of Vietnam’s mountains and forests, will probably be an unforgettable image of February 2019. This is the first time after 55 years, a head of state from North Korea has traveled to Vietnam. 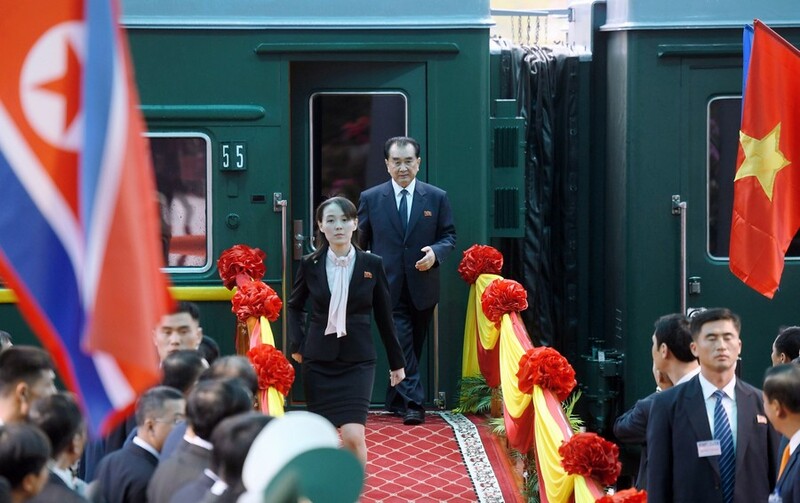 And this is also the first time a North Korean head of state has taken a straight train from Pyongyang to Vietnam. At 6:55 am, February 26th, the train no. 3058 of North Korea reached Vietnamese territory. Lang Son province welcomed North Korean President with its chilly spring weather and drizzling rain. Although he has just had a long journey, Mr. Kim Jong-un still appeared with a bright face and a friendly smile. The weather was cold but people’s hearts were warm. With us, let’s review memorable moments during the first trip of North Korean President Kim Jong-un to Vietnam. The armored train brought North Korean President Kim Jong-un slowly onto Vietnamese territory, passing through Na Pan, Lang Son territory, towards Dong Dang station. North Korea Kim Jong-un stepped off the train in a warm welcome of Vietnamese residents. Kim Yo Jong, Kim Jong-un’s younger sister, was one of the senior figures who accompanied Chairman Kim during the Summit as well as the trip to Vietnam this time. North Korean President Kim Jong-un waved his hand and said thanks to Vietnam’s welcome as soon as he got off at Dong Dang Station. Mercedes Benz S600 took President Kim Jong-un from Dong Dang station to Hanoi, where the Summit took place. Before the car took off, he lowered his car’s window and friendly waved hand to the people. The 12-people bodyguard team performed the familiar security etiquette: Running around the car carrying President Kim Jong-un. … in the warm-hearted welcome of the people in the capital. North Korean President Kim Jong-un’s car proceeded to the Metropole Hotel – venue of the Summit with US President, Donald Trump. North Korean President Kim Jong-un and US President Donald Trump conducted a 1-1 meeting before the expanded summit. The two countries’ delegations conducted an extended meeting on February 28th morning. North Korean President Kim Jong-un during the welcome ceremony at the Presidential Palace chaired by General Secretary and State President Nguyen Phu Trong. North Korean President Kim Jong-un met Prime Minister Nguyen Xuan Phuc. … before boarding the train back to North Korea. Mr. Kim Jong-un repeatedly waved goodbye and made a gesture showing his gratitude before entering the train. The armored train brought President Kim Jong-un to leave Vietnam, ending his longest overseas trip since coming to power.